Living in Georgia, there is one thing we have plenty of- peaches! Peach season comes and you end up with more peaches that you know what to do with. Of course, when they are firm and pretty, you eat them like an apple. But when they get ripe, you can’t just let them go bad! So, you can jar them, jelly them, or bake them. 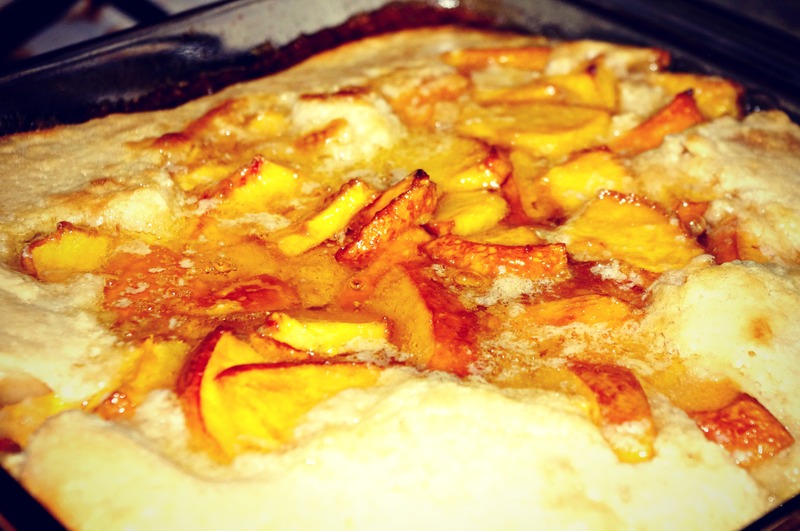 Here is my (fairly famous) brown sugar peach cobbler. You’ll need an 8″ round or square baking dish. 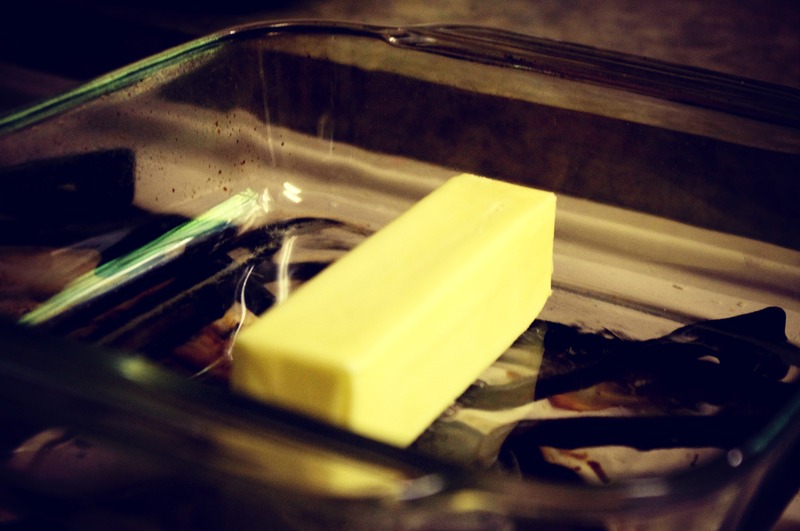 Place the whole stick of butter in your dish and put in the oven at 350. You’ll be melting the butter in the dish while you whip up everything else. Cut up your peaches. Remove the pits. I leave the skin on, but you can remove it if you’re feeling fussy. In a bowl, mix 3 T brown sugar with the peaches. Add 1 t of vanilla extract. Set this bowl to the side. Grab another bowl. Add 1 cup of flour, 1 cup of granulated sugar, 1 t baking powder, and half a t of salt and whisk that up. Add 1 cup of milk and whisk it up. 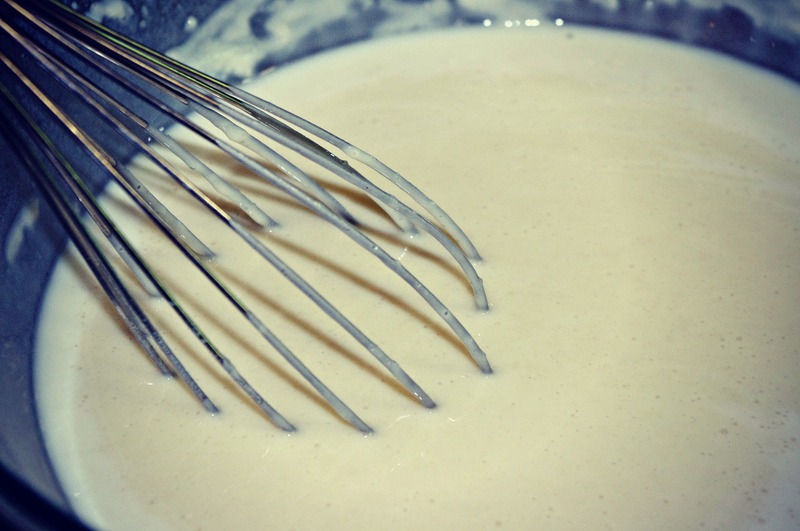 Your batter will be on the thin side. If it seems thick, add a bit more milk. By now, your butter is all nice and melted. Carefully remove it from the oven. You’ll need to carefully add to the butter because it’ll burn like a devil if you happen to splash. Add the batter to the center of the butter first. Don’t mix it. See the picture above. 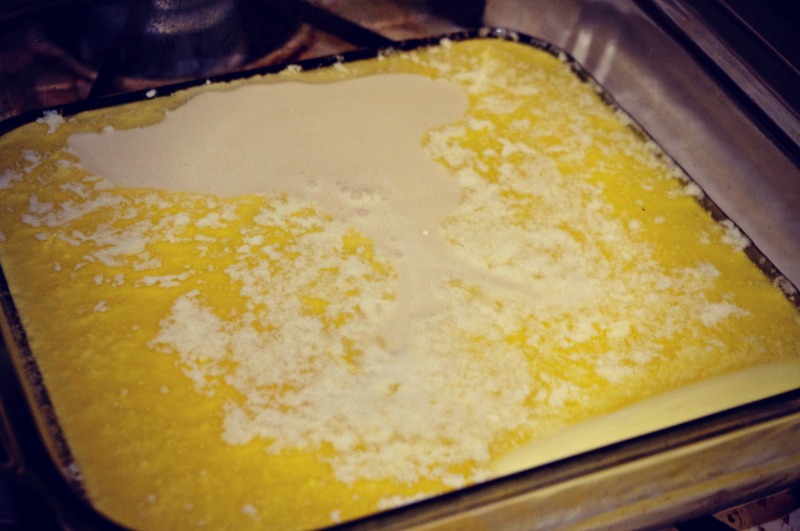 Just pour the batter into the center of the melted butter. Pour the peaches into the very center of the batter. Do not mix it up. Resist the urge. 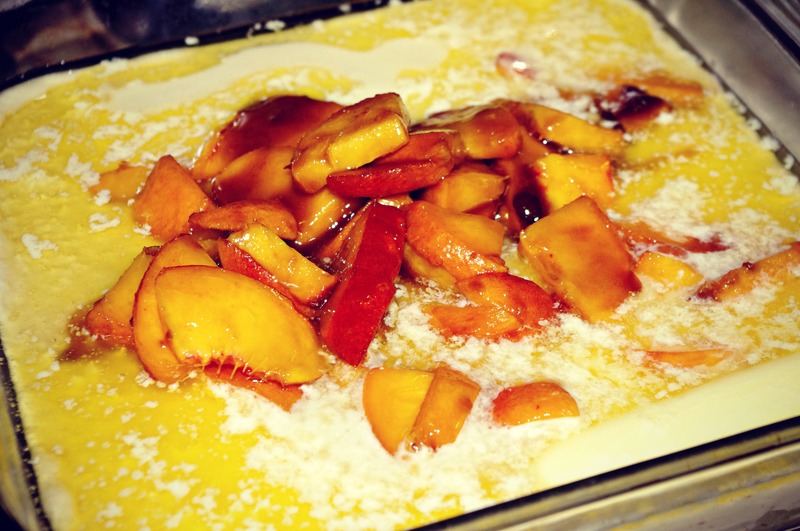 The batter will bake up around the peaches and the butter will brown up on the outside all nice and pretty. You mix it, you’ll mess it all up. So don’t mix. Bake at 350 for what seems like far too long (about 45 minutes) until it is pretty and golden on the top and doesn’t slosh around when you move it. Believe me, everyone in your house will be begging you to just let them at it, make them all wait. You may have to stand guard at the oven door. Once it is pretty and brown (or you can fend the hoards off no longer), remove it from the oven. Let it cool! To serve, serve warm. You can add a scoop of vanilla bean ice cream if you’re feeling super fancy or just happen to like your cobbler a’ la mode. I’d say this serves 6, but more realistically, it serves 4. If 4 of the 6 are kids, yes, it serves 6. Don’t double the recipe. If you need more, you’ll need to bake 2. It just doesn’t come out so nice and pretty if you try to put it in a bigger pan. I’ve tried. I once baked 6 cobbler in one night because you really can’t double the recipe. Now, if you aren’t in peach country and have tons of fresh peaches around for you to use, you can use canned peaches. It isn’t quite as good, but still more delicious than anything your mother-in-law ever cooked. 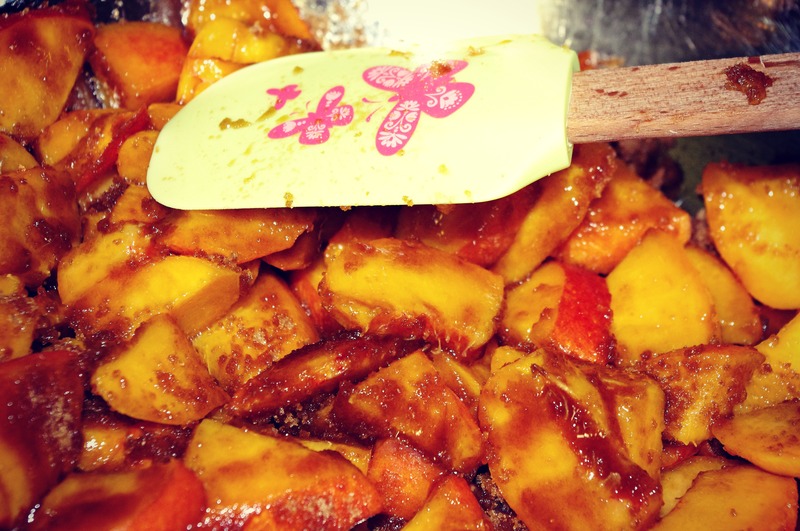 Instead of mixing the peaches and brown sugar, you just make sure you buy a can of peaches in heavy syrup and pour the whole can into the center of the cobbler. You can also use other fruit. Blackberries make a lovely cobbler, too! Sounds yummy, I’ll have to try this sometime this week. My, that looks lovely, it remind me of my French grandmother’s clafoutis. I located your blog through Goodreads. I too, am an author, albeit, a writer of cookbooks. My latest, A Biblical Feast: Ancient Mediterranean Flavors for Today’s Table might be of interest to your readers. It is a lovely little gift book, fully illustrated, with recipes based on the 84 ingredients mentioned in the Bible. I would be happy to send you a review copy if it is of interest. You can view reviews, and my bio on my website, http://www.abiblicalfeast.com. Celebrate the feast and clafoutis! Thank you, Kitty! I sent you an e-mail about your review offer. Your book looks great. I absolutely love cookbooks. And you do have to try some good southern peach cobbler sometime! Southern cooking does have some roots in French cuisine. The southern version of a cobbler is much closer to a clafoutis than the British suet pudding it is said to be adapted from. It certainly is a treat! Mine is in the oven as we speak! Thank you for your firm instructions not to mix – I was itching to do it but refrained! It is looking delicious and will be a real treat for us in the middle of a tough week. Greetings from Auckland, New Zealand.